Whhooohhoo Its Friday and I am already sooo excited for the weekend. This week has been really tough at work and I have been waiting for it to end soon. Hope the next week would be better. I made a card this morning for Digital Doodle Club Challenge and took the colors from Curtain Call color challenge#27. I didn't had a color challenge in mind for this card but the colors at current Curtain Call Challenge are fab and go well with my image. I am putting this card for Sentimental Sundays Challenge which was to show flowers and sentiment. So here is another card I made for CPS Sketch #164 and 2 Sketches 4 You. Both of which coincidently have similar sketch. I have been in my water color mood for the past few days, so just painted this little scenery and drew the checks with crayons. The sentiment is of course hand written. Most of the time I am lazy to do the inside and do it only when someone asks for a card but this time I did it :). Here it is. Happy Weekend to all you lovely people out there!! Hope you are enjoying the holiday and the good weather!! I had to do a lot of work for this one. I didn't have a grey card stock so I cut out a piece of handmade paper and colored it grey. The pattern on both the orange and grey card stock has been drawn with hand. I again used some fruit packaging for the bow and finished with a heart brad. The flowers and hearts are hand drawn and I used a orange furry dust (No idea what its actually called :) ) to cover them up. I hanged the hand written sentiment using the fuchsia ribbon. 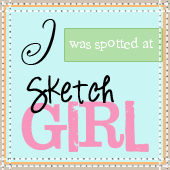 I used the sketch at Sketch Girl for this one. Happy Sunday to all you lovely people !! Hope you are enjoying the weekend !! I used the image from Katherine at Countless Joys and I loved it completely. I used some of the fruit coverings for the base and have hand written the sentiment. The tree has been painted using water colors and I had so much doing it. I used green corrugated sheet for the base and some pattern paper. The brads are from basic grey. I think this card would ideal for Father's Day or probably dad's birthday because I feel fathers are just like trees - they always stand by us and provide us with all we need. Hello !! Today its just a quick post. I made a card for Moxie Fab World Sketch this weekend and have been quite lazy to post it. I am also putting this up for Crafts and Me Challenges who are hosting their first challenge as Fairies or Wings. Today, I just wanted to share a card with you. This one is quite different in the sense that it is completely that hand painted without the use of any embelishments or pattern paper. Let me start with a good news. I am so excited and happy to be considered for my first Guest Design Team Spot at Challenge up your life....yippeeee !!! Hope to inspire and make everybody proud of my creations. Check out the challenge every fortnight at Challenge up your life and you will see some inspiration from me there for the next two months.